I have always enjoyed young adult literature and I as my niece and nephew have gotten older I'm learning to enjoy middle grades stories as well. However, my niece and nephew prefer genres that I'm not too keen on. My niece loves epic fantasy and I would tell you what she's reading,but she devours books so fast that I cannot keep up. We do have a few series we both enjoy. 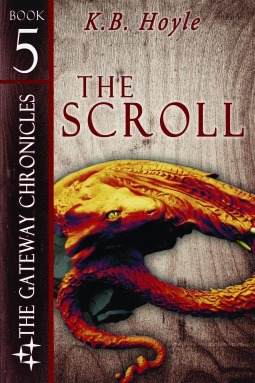 We are both avid fans of K. B. Hoyle's The Gateway Chronicles. Sadly, the last book in the series comes out this fall. Lucky for us, the publisher has moved the date up a month so we will be getting The Bone Whistle a bit earlier. My niece always worries that I will make her wait until Christmas to get her copy, but I'm not that mean. If you are a fan of Harry Potter and Narnia, then this contemporary fantasy series about a group of friends at camp who must save a parallel world will be an excellent choice for your next read. You have 5 books to catch up on before September. We also both enjoy The Time-Traveling Fashionista by Bianca Turetsky. She has read all three of them. I've only read the most recent one about Cleopatra. It is a fun series, particularly if you like fashion. Recently we have started to read Patti Larsen's Hayle Coven. She has only read Family Magic (the ebook's FREE), I think, because she doesn't really like ebooks. I've read the first 6 in the series (there are like 20 books in this series, and then a few spin off series). Ordinarily I don't care for stories about all the mythical fantasy creatures (ie faeries, werewolves, vampires, etc). But I don't mind it so much in this series. I felt the same way with Harry Potter. I didn't want to read that series in the beginning because I didn't like fantasy. Then there is my nephew. We have even less in common when it comes to reading tastes. He's all into graphic novels and horror stories. He did enjoy the Huber Hill series that I bough for him. I only read the first book in the series. I'm going to get him Knightley and Sons (read my review) for his birthday this summer. I'm hoping that there will be more books about this Father/Son paranormal detective team. Last year at Armchair BEA, I won a copy of Dead End in Norvelt and my nephew read it. It worked out well for him since it was part of this year's Battle of the Books (his team won his local school's tournament). Yesterday during the Twitter party I won a copy of Platypus Police Squad: The Ostrich Conspiracy. It looks like his kind of book. I hope you have had a great week. If you missed my giveaway post yesterday, there is still time to enter. I can't wait for my nephews to get a little older so we can talk books! Love that you are sharing a reading experience with your niece and nephew -- even if the genres aren't quite what you read. SHare the reading love! My younger daughter loves graphic novels so I am reading them more and more.